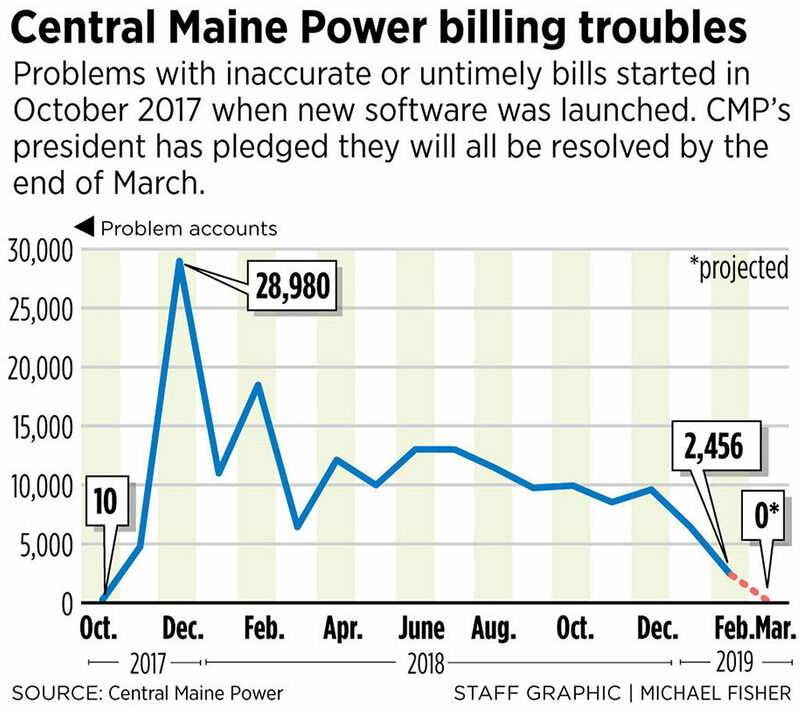 Central Maine Power’s president is telling state utility regulators that the company’s record billing backlog will be cleared by the end of March. In a letter to the Public Utilities Commission, Doug Herling outlined progress and laid out steps aimed at concluding CMP’s 15-month struggle that began in November of 2017, when the utility cut over to a new billing system paradoxically named SmartCare. That transition became a public relations and operational disaster. Tens of thousands of customers started complaining about high and unexplained bills, an outcome that still defies a complete explanation. It is the subject of an ongoing, protracted investigation at the PUC, as well as a pending class-action lawsuit. As of Feb. 22, a total of 1,776 existing customers were awaiting monthly bills and another 2,715 new customers hadn’t received their first bills, CMP calculated. That means more than 99 percent of CMP’s customers are receiving bills that are accurate and on time, Herling said. Herling’s letter came in response to a PUC edict issued Feb. 6. In a scathing missive, the agency’s consumer division threatened to fine CMP for violating its rules. Specifically, the utility was charged with failing to issue monthly bills to thousands of new and existing customers, taking too long to address customer complaints and not addressing a backlog in referring participants to a program meant to help low-income customers who fall behind in paying their bills. 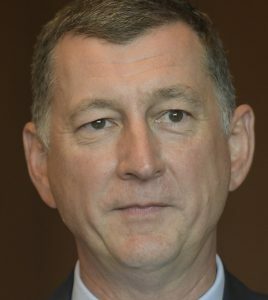 Herling’s assertion that the end of the billing backlog is near was questioned by a citizens’ group that formed around the billing debacle. Lauren Loomis, a spokeswoman for CMP Ratepayers Unite, said new complaints continue to be filed and some billing defects that CMP considered to be fixed remain unresolved. Herling’s response letter was sent Feb. 22 to Derek Davidson, director of the PUC’s consumer assistance division. It addresses the issues raised by Davidson earlier this month. Herling detailed the painstaking process by which workers are manually reviewing bills that are flagged by SmartCare for a variety of reasons. The goal is to keep inaccurate bills from being sent out. Reviewing these so-called exceptions is common in billing systems, Herling noted, but the rate and complexity of the issues identified by SmartCare were well beyond what the company had anticipated and planned for. From the launch date until the middle of last month, Herling explained, the company has corrected coding issues and completed other fixes. It has hired more full-time employees and brought in third-party contractors. These actions are both reducing delays and cutting the rate of problematic bills that need manual review. In Herling’s response, he included graphs depicting the backlog trends. The trend line for new customers shows problems climbing steeply from July 2018 until January 2019, then plunging toward a complete resolution next month. The overall trend for troubled bills shows a spike in December of 2017 with 28,980 cases, trailing off in an uneven decline that runs out through March. “CMP’s plan is to clear the billing backlog by the end of March 2019,” Herling wrote. Billing new accounts also has been a problem, as requests for new service grew over the past two years faster than expected. CMP failed to bill 3,400 accounts for months, a backlog first reported by the Press Herald and blamed on a rash of retirements that left the company shorthanded. The company initially sought to have all ratepayers pick up the tab, but the PUC wouldn’t allow it. Herling’s Feb. 22 response pledges to clear that backlog, largely by hiring and training more workers and using outside contractors. He noted that new customers grew by 4,950 in 2017, and 4,388 in 2018. That’s nearly double the average compared to a few years earlier. One of those new customers is Nina Richard. She has a billing problem and said she’s stunned by the explanation she got when she contacted CMP. Richard moved to Searsport from Florida in November. Three bills came that made sense to her. But her current bill, due in March, is only for an $11 delivery charge. Richard said she called the company on Monday. Richard said she was told that, among other things, the digital smart meters don’t always work right when it’s snowing. The representative suggested Richard might read the meter herself and call in the results. Herling also updated the PUC on two other issues that the consumer assistance division had called out. One involves referring certain customers with delinquent bills to Efficiency Maine Trust. Those referrals are current as of Feb. 11, Herling said. The second issue involves a temporary process in which the PUC’s consumer division has been responding to the high volume of complaints and sending CMP a daily email with names to contact. As of Feb. 6, a total of 3,220 customers had been referred to CMP for special handling and 3,089 of those cases have been closed, Herling said. CMP representatives have worked nights and weekends in an attempt to reach each of those customers. But after two phone calls and a letter, 1,119 customers hadn’t responded as of Feb. 6. Their cases were closed.